The latest reunion between members of divided Korean families, the 21st such meeting since the partition of Korea, took place on 20 August in the Kumgang Mountains. The history of these meetings goes back to 1971, when the South Korean Red Cross Society contacted its sister organization in the DPRK with a proposal for negotiations. This initiative was related to the desire to help families in both the North and the South who had been split up by the war, and who frequently didn’t even know if their relatives across the border were still alive. However the first fruits of the initiative only appeared 14 years later, when the two parties finally managed to agree on an exchange of visits. From 20-23 September, 1985, groups made up of members of divided families, together with arts ensembles from both South and North Korea made visits to Seoul and Pyongyang. 35 people from South Korea, and 30 from North Korea, took part in this historic meeting. Of course, these figures are very small compared to the total number of people whose families were divided – it is estimated that, at the time of that reunion, there were about 10 million people in this situation. It took another 15 years for these reunions to become a regular event. On 15 June, 2000, at the first summit between the two Koreas the two sides agreed to address a range of humanitarian problems as soon as possible, including the question of reuniting divided families. The first round of reunions was held in August that year. They subsequently became a regular event, taking place 2 or 3 times a year, up until 2007. However, no such reunions took place in 2008, and only one occurred in 2009, 2010, 2014 and 2015. In addition to face-to-face reunions, 7 videoconferences were held between 2005 and 2007. Clearly, the holding of the reunions depended on the relations between North and South Korea. On August 4 this year, the two countries exchanged final lists of participants in family reunions. These lists contained the names of 122 people from each country, selected from preliminary shortlists agreed in July. The reunions themselves took place in two stages, from 20-26 August. Over the course of three days, each participant was able to speak in informal surroundings to their relatives from across the border for a total of 11 hours. On August 22 the first stage of the 21st meeting between members of divided families concluded. The meeting took place over three days in the Kumgang Mountains. 89 South Koreans, and 197 of their relatives from North Korea, took part in the reunion, and a formal banquet was held in the evening, attended by the head of the delegation from the DPRK, Park Yong-il, and the head of the South Korean Red Cross, Park Kyung-seo. In the second stage of the meeting, which took place from 24 to 26 August, 83 North Koreans were reunited with their relatives in the South. Despite the fact that the number of families brought together in the reunions on each day is infinitesimal, these events are highly important from a humanitarian point of view. This is one more reason for strengthening mutual trust between the two countries, and an important indicator of the current status of the dialogue between them. Additionally, it is important to note that the problem of divided families has still not been properly solved. 65 years have passed since the Korean Armistice Agreement was signed, and many people, already advanced in years, have been unable to take part in reunions with their relatives across the border. According to data supplied by the South Korean Red Cross, as of the end of May this year, 132 124 people were registered on its data base of South Koreans with relatives in the DPRK. However, of these only 56 890 people, less than half, are still alive, and as time goes by the number of “first generation” family members (i.e. those who were alive at the time of the war) is getting smaller and smaller. 85% of them are over 70, and, in the most recent reunion, 81 members of the South Korean delegation, and 67 members of the North Korean delegation were over 80. 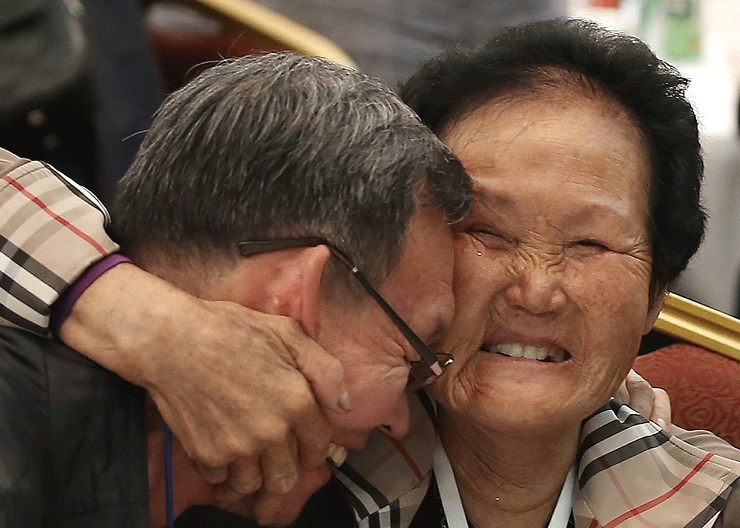 The members of divided families that took part in the reunions held in the Kumgang Mountains are now quite old, and, as a result, this time only seven meetings between parents and children took place. In total, since the reunions began, there have been 20 such events, one of which reunited almost 200 people. It is therefore clear that if the reunions continue at the present rate, many of those who have long dreamed of meeting their relatives again will be unable to do so. In view of the circumstances, it is not enough just to have one-off reunions between members of divided families- these events need to be held on a regular basis. Accordingly the South Korean Ministry of Unification wishes to initiate talks on the holding of regular reunions. It holds the view that a permanent venue needs to be chosen for such meetings, arrangements need to be made for the exchange of letters and video calls, and, ideally, members of divided families should be able to visit their native land. Certainly, each side needs to find out which of the ‘lost’ relatives are still alive. In short, the Korean public strongly feel that both North and South Korea need to keep the problem of the divided families separate from political issues, and consider the future of the program in a calm manner. According to a report issued on August 21 by a parliamentary committee for foreign policy and unification, this and other questions are to be discussed during the next meeting between the North and South Korean Red Cross organizations. And if the format of the reunions really does change, then this will be an important step forward in the development of trust between the two countries. So far, the two sides have agreed to continue to work together closely on arranging another such reunion by the end of this year. A provisional date at the end of October has been penciled in.